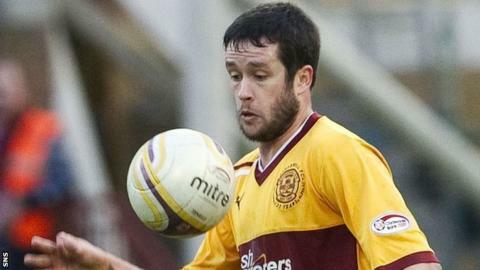 Tim Clancy has rejected a new contract at Motherwell and is close to agreeing a superior deal to join Hibernian. Clancy joined 'Well from Kilmarnock last summer and helped them finish third in the Scottish Premier League. Meanwhile, BBC Scotland has learned Motherwell are keen to sign Inverness Caledonian Thistle's out-of-contract midfielder Greg Tansey. Fir Park boss Stuart McCall was interested in the player last year before he joined the Highland club. Despite turning down a new deal with the Fir Park club, Clancy insisted he would be leaving Motherwell with a heavy heart. "It was a very hard decision for me to leave as I loved my time at the club so much," he told www.motherwellfc.co.uk. "I have read online that I have been quoted as saying that any move away would be a step up - I said nothing of the sort and have no idea where it has came from. "I have too much respect for the club, the manager and the fans for that. "I want to thank everyone for making me feel so welcome and I'll be keeping my fingers crossed for the boys when they embark on their European run in July." McCall is awaiting responses from key midfielders Keith Lasley and Steve Jennings over new deals. Both are out of contract this summer, but should either not agree new deals, Tansey is seen as an ideal replacement.